Flights on demand: Flights according to your needs and your budget. From Lyon to Marrakech or from Paris to Oslo, each flight is tailor made to your date, departure and arrival locations on more than 600 business aviation airports in Europe and around the Mediterranean basin. With reduced check-in procedures, no wait in the departure lounge, the Oyonnair team offers a prestigious service. Peace of mind and safety throughout your trip all while enhancing your productivity. Free parking near the airport, flights from air terminals dedicated to business travel or flights. Arrive 5 minutes before departure in order for you and your colleagues/partners to be seated on the aircraft in privacy. Our crew will wait and delay departure according to your requirements, even after a meeting which has been prolonged or when a schedule has been modified at the last minute. 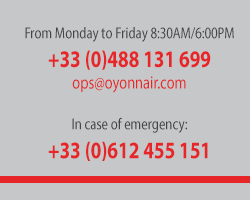 Oyonnair is an airline company. All flights are operated according to public transport regulations. Oyonnair's fleet has worldwide insurance coverage.